Ever since Queen Victoria discovered the magic of the Highlands, owning a Scottish estate has been the ultimate dream (or indulgence) of most of the world’s super rich. And even in times of global austerity, estate agents north of the border are still pleasantly surprised by the continuing demand from overseas buyers for historic sporting domains, especially those with established commercial credentials. The prestigious, 6,981-acre Gledfield estate at Ardgay, Sutherland, 37 miles north of Inverness, was bought in the 1850s by the Matheson family, whose enormous wealth derived from the Jardine Matheson trading empire in the Far East. Between 1895 and 1907, Sir Kenneth Matheson commissioned the Scottish architects Ross & Macbeth (who also transformed Skibo Castle for Andrew Carnegie) to restore and enlarge 18th-century Gledfield House, which stands in a secluded, 60-acre, wooded parkland setting on the banks of the River Carron. The late 20th century saw a decline in Gledfield’s fortunes, and the estate was in a state of some neglect when the Swarovski crystal family of Austria stepped in and bought it in 1999. It spent a reputed £1 million reviving the estate and restoring the impressive four-storey house, which has three grand reception rooms, eight bedrooms, seven bathrooms and a staff flat. In addition to the luxuriously appointed main lodge, there are eight further houses and cottages providing staff accommodation and short term or holiday lets. Now, following the family’s decision to move on, the pristine Gledfield estate, which includes a small in-hand farm, a stable block with garaging for six cars and more than 2,000 acres of well-kept commercial forestry, is being offered for sale through Savills (0131- 247 3720) and Sotheby’s/William Montgomery (028-4278 8668) at a guide price of ‘offers over £8m’ for the whole. The Swarovskis have enjoyed Gledfield as a low-key family sporting retreat and a discreet venue for elite business entertaining, but for many foreign buyers, the carrot is probably the chance to achieve the elusive Macnab-shooting a stag, bagging a brace of grouse and catching a salmon, all within 24 hours. Some 5,000 acres of hill to the south of Gledhill House offer a wide variety of terrain, which can be stalked in most winds, with the commercial woodlands at the eastern edge of the estate providing excellent shelter for deer. With the aim of preserving stock, no grouse have been shot on the Gledfield hill in the past 10 years, but records dating from 1931 show an average bag of 433 brace between that year and 1942. And it’s a short stroll to the Gledfield Water, a one mile stretch of the famous River Carron, where 15 named pools have produced an average annual catch of 40 salmon in the past 10 years. Today sees the launch in Country Life of an even greater chunk of Scottish wilderness, the 28,313-acre Auch and Invermeran estate, which covers some 60 square miles of dramatic southern Highland terrain on the borders of Argylland Perthshire, for sale through Knight Frank (0131-222 9600) at a guide price of ‘offers over £8.4m’. ‘The opportunity to purchase a landscape of this scale with good accessibility to the central belt of Scotland is quite extraordinary-everything you see, you own,’ says selling agent Ran Morgan, for whom Auch and Invermeran encapsulates all the romance of a fairytale Scottish estate. You can even jump on the overnight ‘Deerstalker Express’ at Euston station and wake up the following morning on your own estate railway station at Bridge of Orchy. Over the years, the owners have invested heavily in the sporting, farming and tourism potential of the estate, which also offers huge scope for hydroelectric generation and the chance to combine business with pleasure. The main house on the estate is Auch Lodge, a modernised, L-shaped stone house, built in traditional Scottish vernacular style with six bedrooms, four bathrooms and a one-bedroom annexe. It stands in a sheltered spot at the bottom of the valley, surrounded by trees and close to the estate’s complex of seven farm and holiday cottages and the main steading, and overlooking the confluence of the Allt Kinglass and Allt Coire Chailein rivers. There is also planning consent to build a six bedroom lodge elsewhere on the estate at Glenmearan. ‘The days when vendors of sporting estates could rely on people with high-paying jobs down in London buying into the Scottish fairytale are probably gone. Today, even rich estate owners are keen to make their Highland acres work for them,’ explains Patrick Paton of Smiths Gore (0131-344 0888), who recently launched the spectacular Killean estate at Tayinloan, Argyll, with a guide price of ‘offers over £7.5m’. The 3,684- acre estate comes with a vast range of commercial enterprises as well as a splendid main house, a host of other properties, two broke out, destroying the whole house apart from the billiard room wing and the impressive teak porch built by Clyde shipbuilders. The surviving wing formed the basis of what is now the Garden House beside the walled garden, and the porch was incorporated into a new Baronial-style mansion designed for Macalister by the eminent Arts-and-Crafts architect Sir J. J. Burnet. Recently refurbished by its current English owner, a successful international businessman, Killean House, listed category B, has four grand reception rooms, three main bedroom suites, seven guest bedrooms and two bathrooms. Independent agent George Goldsmith (0131-476 6500) is handling the sale of two fine Highland sporting estates where the dream is based on sound miles of sandy beach and breathtaking views of the islands of Gigha, Islay and Jura. Income generating opportunities at Killean include farming, commercial forestry, field sports, holiday lets, a hotel, a shop and a petrol station. Renewable energy development is also on the agenda, with consent for a hydro scheme already secured. 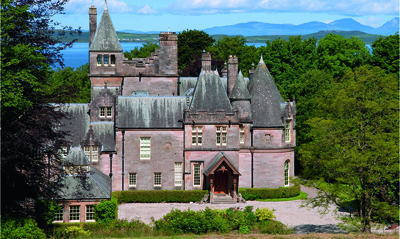 In 1875, Killean was bought by the colourful Far Eastern entrepreneur James Macalister Hall, who immediately embarked on the restoration of the original Killean House. The project was almost complete when a fire commercial principles. Offers over £5.9m are sought for the hard-working, 2,000-acre Cardney estate near Dunkeld, Perthshire, which offers an array of sporting and commercial enterprises within its magnificent terrain. These include hill and woodland stalking, a renowned pheasant and partridge shoot and one of Scotland’s major trout loch fisheries, along with a fishing lodge, a bistro and a conference facility. Residential assets include a manageable main house with planning consent to extend and six further estate cottages for rental or staff accommodation. The same agent wants offers over £2.5m for the 635-acre Ardlamont estate on the Cowal peninsula near Tighnabruaich, Argyll, where a number of business ventures are already up and running, with agreed planning consent for further development. At the heart of the estate, which has 2.4 miles of coastline and glorious views towards Goat Fell on Arran and across the Kilbrannan Sound, is a fine eight-bedroom, late- Georgian main house, with a two-bedroom annexe and a walled garden. Four further estate cottages provide self catering or staff accommodation. Sporting facilities include rough shooting, wildfowling, red- and roe-deer stalking, and salmon fishing on the foreshore, with easy access to sailing from the nearby Portavadie Marina. Other commercial operations include a successful livery stable, and the Cedar House tea room that doubles as a popular wedding venue.